Last weekend it rained and we started craft projects all over the house, painting and decorating for Halloween. This weekend we finished it all and it's quite the gallery. Taste Tester prefers to be known now as "Freed", the Artist. Freed used the tree that was taken down 2 years ago, which we saved, to make this bench by hand. It took a full week and it's gorgeous. The insects that crawled out of it were a little frightening, but all tenants were evicted before it was sealed. He's planning to make a matching bench out of the other half of the top piece. 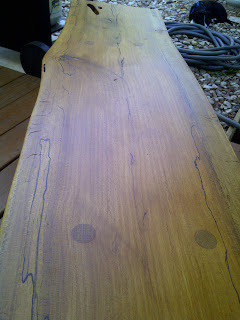 Anybody have a fallen tree you want turned into something memorable? Next he made me tombstones for Halloween. Nothing says "Honey, I love you" like a headstone. 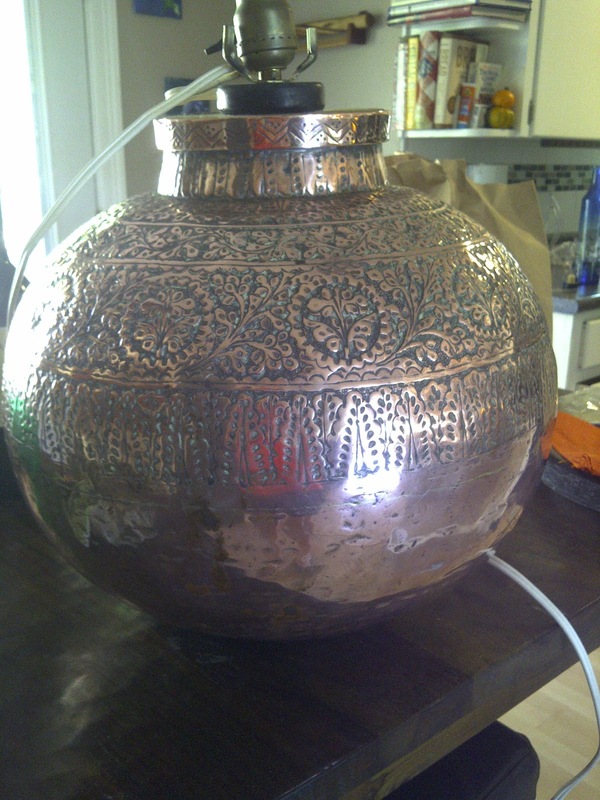 Finally, I got this beautiful copper globe lamp from my brother, who had inherited it from our grandparents, who had found it in Pakistan when they lived and worked there. It's older than I am, and it hadn't been shined up in ages. As long as I could remember in my childhood, it had looked like a dull brown blob of metal. Half a can of Brasso, one bout of tendonitis, and 5 cleaning cloths later, it gleamed.